At its core, CareTaker is a platform technology that can measure CNIBP and other physiological data for viewing by Clinicians. Using our low-energy Bluetooth technology, CareTaker can also collect and display data from other BLE-capable devices such as weigh scales, gluclose meters, insulin pumps, and fall detectors, to provide a comprehensive view of a patient’s health. 30% of all ICU Patients receive an invasive Arterial Catheter for continuous blood pressure monitoring (over 7M placements in the US), and have significant complication rates (infection, occlusion, sepsis, etc. (Figure 3). 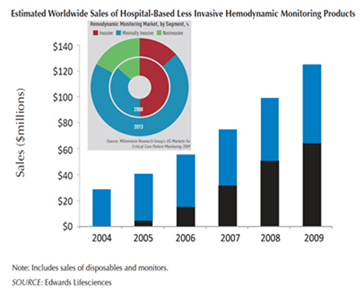 Non Invasive Hemodynamic Monitors are emerging to replace A-Lines, accounting for $150M of $540M annual market. CareTaker’s Low-Cost, Realtime, Beat-by-Beat BP and HR is a tested solution which reduces risk and dramatically reduce costs. 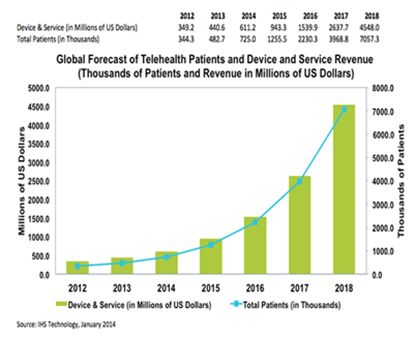 By 2018, there will be 7 Million “Telemedicine” patients representing a $4.5B Market (Figure 2). CareTaker can easily be sent home with a patient to track vital signs securely. 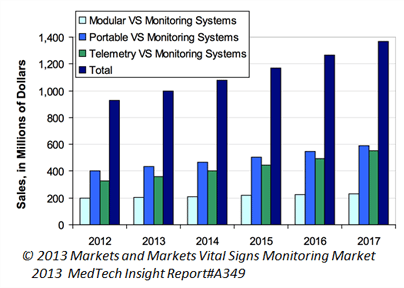 Still dominated by ‘traditional monitors’, the global market for Vital Sign Monitors is $3.15B, growing at 6.6% CAGR. The US market will grow 40% to $1.3B in 2018 (Figure 1). Traditional Monitors can ‘talk’ to central nurses stations, but still are still mounted on a wall or pole and require a cumbersome myriad of wires, leads, and hoses to be connected to the patient. Wireless Mobile monitoring studies suggest lower hospital costs and improved outcomes. CareTaker may reduce hospital liability by monitoring pre-admit ER patients, waiting for bed, during ambulatory transport, etc.